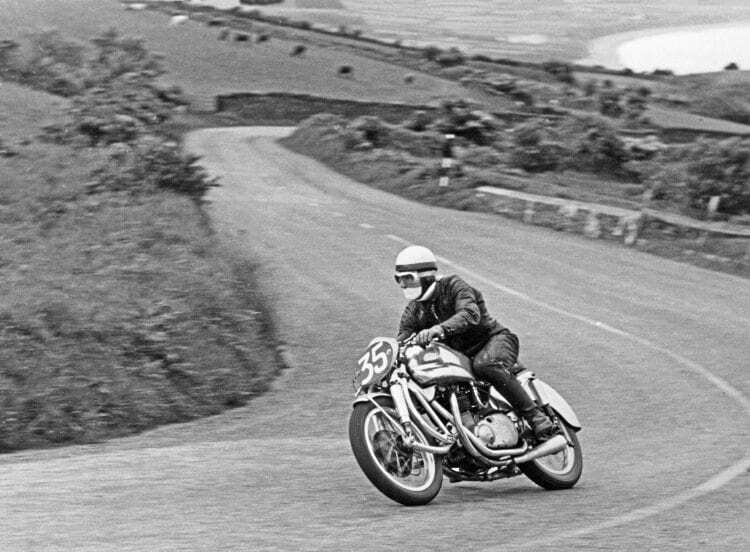 This is Cecil Sandford in TT practice on the Ernie Earles BSA, in 1952. This machine was actually built in 1952 by Ernie Earles of Elms Metals in Birmingham. An impressive looking machine, with its duplex all-welded aluminium tube frame, housing a possibly ex-works BSA A7 engine. I believe that this lightweight frame was offered to Norton’s Joe Craig who turned it down and also refused to supply Earles with a Manx Norton engine. Note also Earles’ patented leading-link front fork design, adopted under licence by MV and BMW. It was ridden by BSA employee Charlie Salt, who finished 18th in that year’s Senior TT. As mentioned in Howard’s letter, double world champion Cecil Sandford also rode the machine – I wonder what he thought of it? A very talented rider who rode some interesting ‘works’ machines – may I request an article on this almost forgotten former world champion?